Cute and fun describe Head Soccer APK 5.1.2 very well. A soccer-based game, it is a fun and brutal game for your Android device need. On a football field, you will face against your opponent in a kick-in duel and getting the top score is definitely your aim. It may sound casual, but the fun starts with the players. As you duel against your opponent, you will control a giant, oversized head to score goals and beat your way out of your opponent – literally. More surprises await you. They are definitely amusing and hilarious. All you need are three buttons to play the game. One button to jump, leap up, and head home. Meanwhile, the other button is to hit the ball, and a final button you can use to unleash super shots. Scoring goals is one aim, but hitting your opponent is also another way to bust your way to win. Such gameplay will definitely make both players’ characters bleeding hard, but that is where the fun begins. You will laugh as your oversized head character kicks your opponent in many hilarious ways possible. With 30 various characters to choose, the fun is getting even funnier than before. Head Soccer can also be played multiplayers, and it gets even funnier as you kick your friend’s character and vice versa. Various super shots add more fun to the gameplay, with each character bearing different kind of skills and shots. If you are into bragging your achievements, this game gives you the option to save your achievements in various social networks. Being a hilarious game, Head Soccer is a fun addition to your Android device. Head Soccer for Android will turn you into a head-butting football player and hopefully does not turn your head bigger like the way it is on the game! 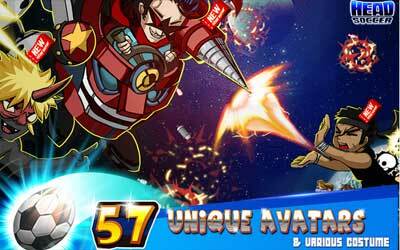 Various 62 Avatars & Unique Special Shot ! !